Whether you live in a mansion or a tiny house you’ll want to finish your house in a style that suits you and is practical. Considering the kitchen is one of the most important rooms of your house it is only natural that you spend a little extra effort and funds on getting it right. What you may not have considered is the possibility of building it yourself; it is possible. You need to consider how easy it is to get from the stove to the refrigerator and the sink. It’s also important to work how much counter top space you really need. You may find it useful to use an online tool to map the kitchen and create a virtual image of the result. Once you’ve designed it you should use the services of a reputable firm like sjd.com.au to custom build the cupboards for you. This is not as expensive as you think and will give you exactly what you need in the space. While you wait for the cupboards to be built you can select the right counter top and back splash. In fact this is a great opportunity to prepare and paint the walls ready for your kitchen. If you’re rearranging your kitchen or even creating one for the first time then you will almost certainly need to adjust the current plumbing and electrics. You may even need to add some new sockets and plumbing points. If you are confident and have some experience it is possible to do this part of the work yourself. However, you may prefer to enlist the help of a professional. Whichever option you decide to go with you’ll need to make sure you’re familiar with all the current regulations. This will ensure you don’t have a problem if you decide to sell or if you do need to make an insurance claim. You’ve probably planned for your stove; it may even be built into your cupboard space. But have you considered the dishwasher or whether you need a washing machine in the kitchen? When you’ve finished building your own kitchen it’s too late realizing that you’ve missed the appliances; including a location for the refrigerator and freezer. Make sure you consider them during the planning stage to get your new kitchen just right. With your cupboards, counter tops and appliances in you’ll only need to add the finishing touches; such as the back splash. This can be tiles or metal or even laminated plastic. Choose the one that accentuates your kitchen best and then fit it. 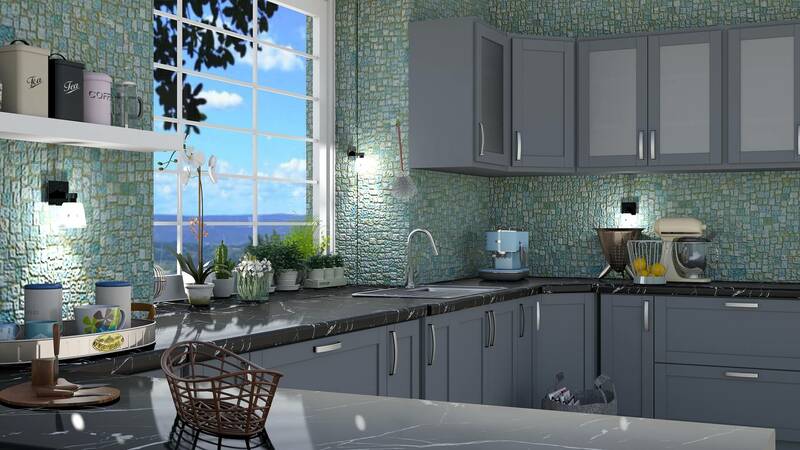 It will make a huge difference to the finish of your kitchen which is why you make sure it reflects your personality and the image you want for your home.